You're going to be getting new-to-me posts for a while. 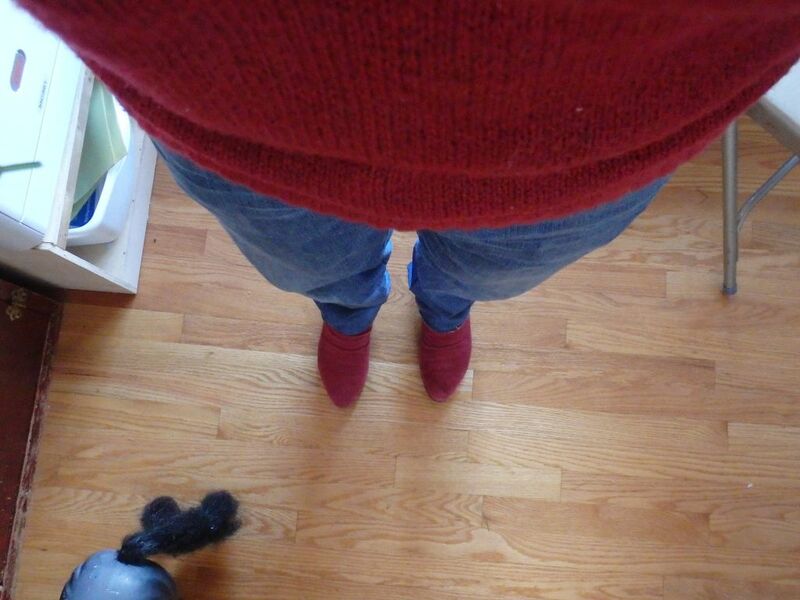 Today I wore my "Saturday jeans" with a new-to-me red sweater. I've been looking for a sweater in a dark red or burgundy with an open neck (i.e. not a crew or turtle neck) for quite a while - and while the color isn't difficult to find, it seems to have a lot of way too short lengths around here. What do you think? Does it fit the "red pullover sweater" hole? Nice, I like this shade of red. I love the shade and how it matches with the booties. YOu could also wear an untucked patterned button down under it for added interest. Maybe not with the shoes (?) but by itself is a lovely shade and a cosy fit. Well, I happen to like bookending myself, so I say, enjoy! It's very pretty. I love it with the booties. I love this color red, and while it does match those booties pretty dead-on, I think that works for a bookended look. But you don't always have to wear it this way. Try other boots or shoes next time to mix it up. It's a great sweater on you, awesome choice. Great find. That shade is perfect for you. Love the bookending with the boots! Enjoy your new purchase. Love this red on you Amiable! Great find! What a beautiful colour for you! The difference in texture between the sweater and the shoes makes the look less matching and more bookending to my eye.